You are here: Home / Building a Beach House / What’s in Our Kitchen? Over the years when we’ve rented homes, I’ve always appreciated knowing what what will be in the kitchen when we get there. Here’s the scoop on the Owlhaven kitchen. Appliances include a gleaming 5 burner Bosch gas range, a European style microwave, an oversize sink with a touch-controlled faucet, and TWO dishwashers. One is next to the sink in the island and one is across from the sink. We also have two refrigerators. One is 26 cubic foot with French doors and a freezer underneath with an ice maker inside. The other is an under-counter wine fridge, perfect extra space whether you choose to use it for wine, beer, juice boxes, or an extra gallon of milk or two. Small appliances include a hand mixer, coffee pot, hot pot, coffee grinder, electric griddle, toaster, crock pot, waffle iron, rice cooker, and a blender. 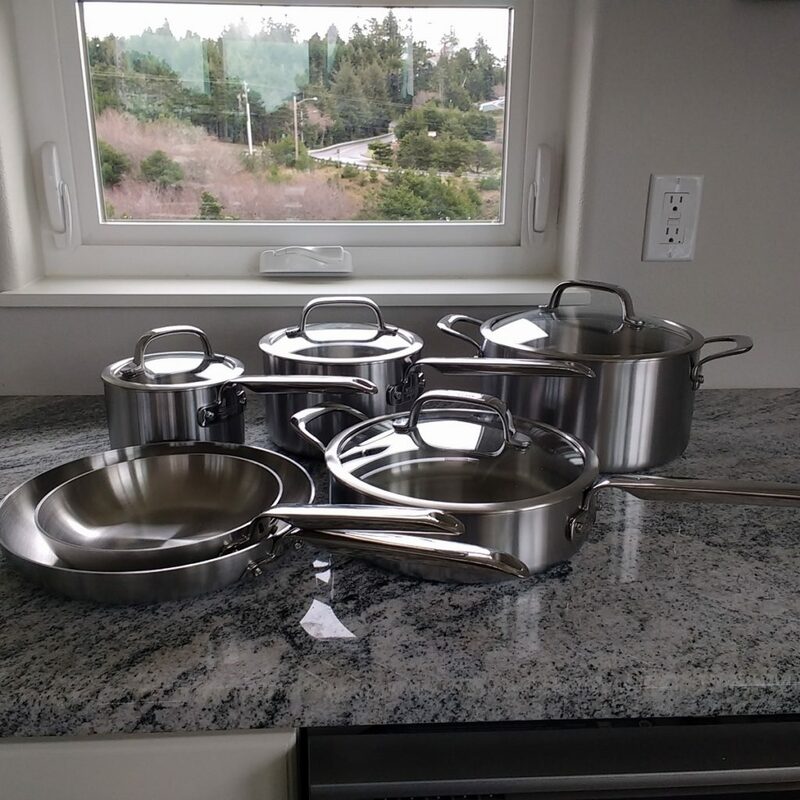 The avid baker will find casserole pans, cookie sheets, a cooling rack, a muffin tin, mixing bowls, splatter shields, cutting boards, and measuring cups and spoons. Also in the pantry you will find a variety of common spices and seasonings, as well as helpful cooking additions such as cooking spray, oil, Crisco, sugar, baking soda, and baking powder. Usually you will also find at least a few packages of microwave popcorn, as well as coffee beans ready to go into the grinder. Use what you need, leave what you don’t use, and let us know if there’s something you wish we’d stock in addition to what’s there. And speaking of that pantry, here’s one thing you will also find: plenty of EMPTY shelving ready to receive all the food you’ll be bringing to feed your crew. Many vacation homes where we’ve stayed had every shelf already full, meaning our food for the week had to sit out on the counter, making the kitchen look cluttered, no matter how gleaming it might be. Here you won’t have that problem. 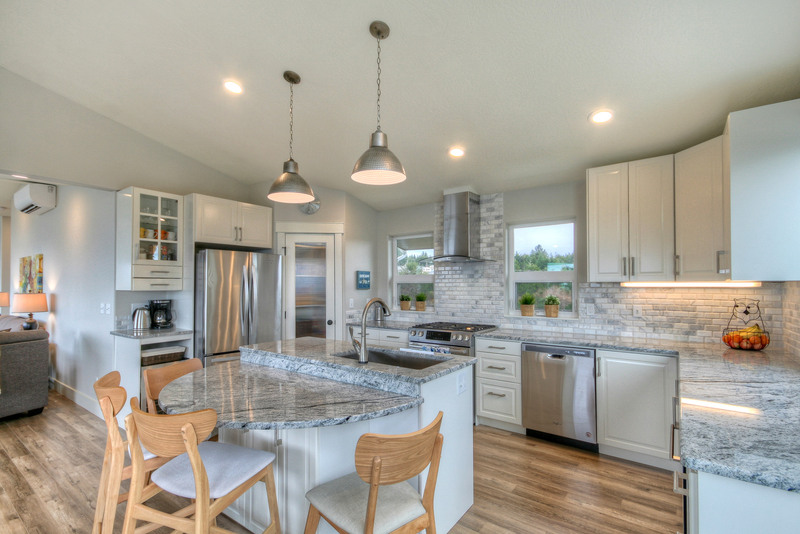 Tuck your food away and enjoy the spacious beauty of this kitchen, knowing that everything is here, conveniently within reach, while still being tucked away unseen. 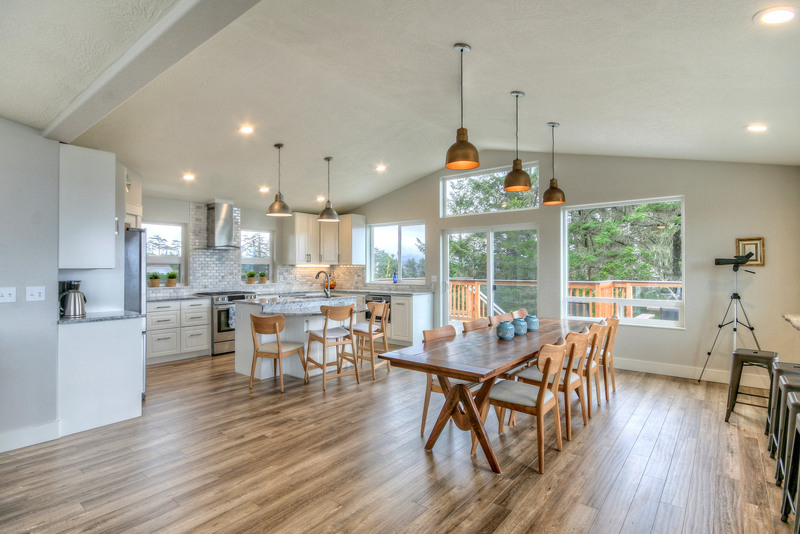 Finally, here’s one last thing you’ll find when you’re standing in this kitchen: ocean view for miles! Watch the sunrise while you’re at the range, and the sunset when you’re at the kitchen sink. The views are stellar. Can you think of anything else you might need in the kitchen of a vacation home? Just let us know! We’re always open for comments, ideas, and feedback. Check out the booking calendar if you’re interested in planning your own Owlhaven vacation!